You are here: Home » Life Issues & Bioethics » Cloning, Embryo Research & Genetics » Does the State Have Your Child’s DNA? I hate to be so sensational, but I think it is important for parents to understand that your child’s DNA maybe stored in a state government facility and you have no idea. Impossible, you say? You know that heel stick that your child got in the hospital right after birth? Some states keep and catalog that blood for use in further research and some envision a time when a whole genome scan is performed on that sample. Nature recently called the information stored on these cards a genetic “jackpot” and there are scientists who would love to be given access to that treasure trove. In addition, there are real concerns that the information provided by that seemingly innocuous heel stick could be used to usher in a new era of eugenics. Now I am not saying that the newborn testing programs that screen newborns for devastating genetic conditions are evil. I think these newborn screening programs are important to the health of American children. However, I am very concerned that parents are not informed about what happens to their children’s blood after it leaves their precious little feet. I am sure that parents do not know that once the blood leaves their child, it is often the property of the State. Newborn genetic screening is done at State health department laboratories. Hospitals send newborn blood on a special card to the health department. The test results are then sent to the infant’s physician. Some States—perhaps all States—register newborn test results in a state database…. Public health agencies not only collect genetic testing data, they collect DNA—the baby’s blood. Hospitals are required to send more blood to the agency than is needed for the testing. This over-collection provides health officials with a rich supply of citizen DNA that some states are already using for research without consent…. 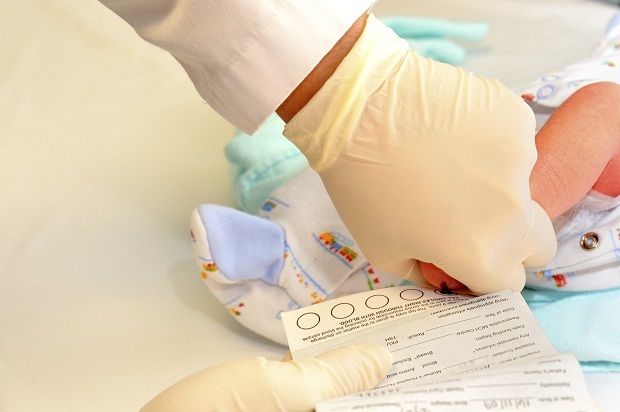 Twenty states store newborn blood samples from one to 23 years. With 4 million babies born each year and at least ten states retaining newborn blood indefinitely, the repository of infant DNA is large and growing. The baby’s DNA is considered state government property. According to the book, The Stored Tissue Issue, there are currently “more than 13.5 million newborn screening cards in storage and new cards being stored at a rate of 10,000 – 500,000 cards a year, depending on state populations.” Most parents have no idea this is happening. The issue here is not the newborn screening. It is the fact that parents are not being properly informed about what is being done with their child’s DNA. States do allow parents to “opt out”, but that means that their child does not get the benefit of testing. Parents need to be given the option of having their child’s sample be destroyed after the testing is done. Any storage or use of their child’s DNA for research should be an “opt in” situation where informed consent is given by the parents for any use outside the scope of the initial genetic testing. This chart complied by the Citizens’ Council on Health Care lists State by State government newborn blood & baby DNA retention practices. Covering 2001-2009, it lists whether or not your state stores your child’s blood from a newborn screening card, and for how long. And remember, in most cases the blood and DNA on those cards are considered the property of the state. If the information on this chart bothers you, I suggest contacting your state representatives and letting them know. In general, [courts] have ruled that once your tissue leaves your body, you no longer maintain any rights to it. They analogize tissues to, say, the donation of a book to a library. But people have a strong feeling of ownership about their bodies, and that feeling will never be abrogated by a mere legal technicality. Therefore we need new, clear, emphatic legislation…. The notion that once you part with your tissue you no longer have any rights is absurd. Consider this: Under present law, if somebody takes my picture, I have rights forever in the use of that photo. Twenty years later, if somebody publishes it or puts it in an advertisement, I still have rights. But if somebody takes my tissue—part of my physical body—I have no rights. This means I have more rights over my image than I have over the actual tissues of my body. The required legislation should ensure that patients have control over their tissues. I donate my tissues for a purpose, and that purpose only. If, later, someone wants to use them for another purpose, they need my permission again. If they can’t get permission they can’t use my tissues. I agree. Especially in the case of newborn screening cards. At the very least, parents should be fully informed about what happens to our children’s DNA once it leaves their bodies. Parents need to be given the option of having their child’s sample be destroyed after the testing is done. Any storage or use of their child’s DNA for research should be an “opt in” situation where informed consent is given by the parents for any use outside the scope of the initial genetic testing.